Beautiful combination of multi color mixed shades, comes along with zari floral motifs in middle of the parikine arranged in a linear fashion along with contrast zari border gives a traditional touch during this festive season. The contrast matching blouse is attached to it. Mustard color voni with zari border and attractive pallu Length: 44 inches Age Group: Above 11 YEARS. NOTE: Same day Delivery for Hyderabad and Secunderabad. For other places requires minimum 2 to 3 WORKING DAYS. Beautiful combination of multi color mixed shades, comes along with zari floral motifs in middle of the parikine arranged in a linear fashion along with contrast zari border gives a traditional touch during this festive season. The contrast matching blouse is attached to it. 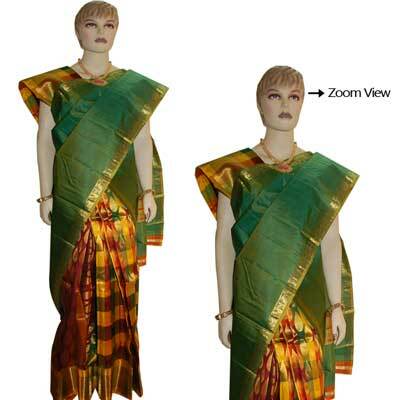 Mustard color voni with zari border and attractive pallu Length: 44 inches Age Group: Above 11 YEARS. NOTE: Same day Delivery for Hyderabad and Secunderabad. For other places requires minimum 2 to 3 WORKING DAYS. Accessories shown are not part of the product.